BRATTLEBORO -- You never know what you'll stumble across in the woods. David Allen found a hobby, a labor of love, the subjects of six books, reasons to travel all over the country and a way to celebrate Brattleboro's 250th birthday. Allen, a West Chesterfield, N.H., resident, recently published "Early Maps of Brattleboro, Vermont, 1745-1912," a book which should be of interest to local history buffs, students, land -owners and anyone curious about how this town came to be settled. And it all started with a walk in the woods. "I'd walk through the woods and I'd find an old foundation. I wanted to find out about it, so I looked at old maps. I thought that was just fascinating," said Allen. "That's how I got interested in old maps, from hiking." But it's turned into much more than a hobby. Over the last 20 years, Allen's map quests have led him to libraries and collections all over New England and to the Library of Congress. A resourceful researcher, he has discovered maps of historical significance that no one knew existed. And he has come to know the history of the area like few have. Previously, he published books of early maps of Greenfield, Mass., and Hinsdale, Winchester, Swanzey and Keene, N.H. On Dec. 10, "Early Maps of Brattleboro" was published -- just in time for the town's 250th birthday. "I thought this would be a good way to commemorate Brattleboro's 250th anniversary," said Allen, noting that the town charter was signed on Dec. 26, 1753. The 76-page book contains nearly 50 maps of Brattleboro, from its earliest days as wilderness country, when Massachusetts built Fort Dummer to protect its settlements in Deerfield and Northfield; to formative years when Brattleboro was one pawn in the "huge power struggles between colonial governors and their big-shot buddies," as Allen puts it; to the early years of the 20th century, when this thriving Vermont town had four drug stores, a tobacconist, a telegraph office, two grocers, a wallpaper store, three "clothing and furnishings" businesses, two paint stores, three banks, a cobbler and a printer, all on Main Street between Elliot and High streets. "What a map does is, graphically and quickly, you can see cultural changes," said Allen. "You can see, at certain periods of time, tremendous growth. For example, Brattleboro experienced tremendous growth after the Civil War." Allen has written a narrative history that accompanies the maps and puts them in context, and his writing is insightful and instructive. But he hopes the book will trigger other revelations. "I'd love to have people do an analysis of them. A map is full of tons and tons of information," he said. "I'm hoping amateur historians will look at them and discover new things." Allen made a valuable discovery of his own while researching his book. "These maps are very obscure; some of them are unknown. I've got a map from the National Archives that nobody in Brattleboro has ever seen," he said. That map, created in 1830 by the U.S. Army Corps of Engineers, shows the route of a canal proposed to run roughly where the train tracks are now to improve river commerce along the Connecticut. Other rare finds include a map of Fort Dummer made in 1749. A modified copy of the map made in 1891 has been seen before, but Allen located a photostat of the original map at the Vermont Historical Society. The version Allen found contains much written information about the construction details of the fort and who was living there. That information is included in the CD-ROM which accompanies the book. A third rare find is a 1724 drawing of the original proposal for Fort Dummer by Col. John Stoddard. With hostilities with the Indians looming, Stoddard specified that the fort "be made of of hewed timber" and called for "the Timber to be bullet-proof." Allen found this map in the Beinecke Library at Yale University. Why? Because pioneer Fort Dummer soldier Timothy Dwight was the grandfather of an early president of Yale, also named Timothy Dwight. Those are the journeys historical research can take you on. "I really enjoy research. I enjoy the process," Allen said. Readers may enjoy poring over old maps to find where their houses are and what the town looked like in 1852, 1869, 1876, 1886, 1895 and 1912. They may also enjoy some of the oddities they'll find. One map describes Wantastiquet as "a mountain which appears to be a volcano." Another is a map sketched by Rudyard Kipling, who feared that the trains barreling down the tracks would spook his horses as they traveled what is now Putney Road to Brattleboro. In a corner of a map, the colorful Kipling drew a gravestone on which is written "in the midst of life we are in death," apparently as a warning of the dangers to the railroad company. Aside from the information the maps hold, Allen finds them aesthetically pleasing. "I've always liked maps because of the shapes and features. Brattleboro has a lot of that with its topography and the water," Allen said. "The older maps tend to be more like works of art. Modern maps are very complete, but their very completeness and accuracy tend to take away from their beauty." An exhibit featuring old maps, the town charter and other important historical items is on exhibit at Brooks Memorial Library through December. 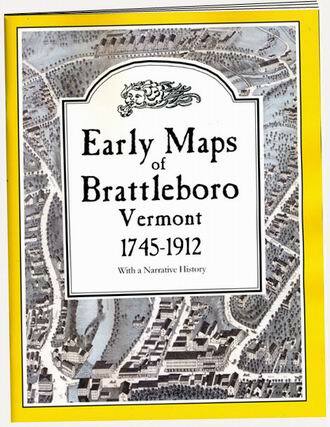 "Early Maps of Brattleboro," which includes the CD-ROM is available at local bookstores and at Baker's.
. Send EMAIL if you have any questions. be sure to mention "Early Maps of Brattleboro"